Maison Martin Margiela will launch a new duo of dry body oil fragrance "filters" in August. The two filters, Glow and Blur, are intended to be layered with the fragrances from the brand's Replica collection. Glow (shown) ~ to add 'the vibrancy of a sunny afternoon', with notes of neroli, grapefruit blossom, bergamot and rose. Blur ~ to add 'soft focus', with aldehydes, jasmine and musk. 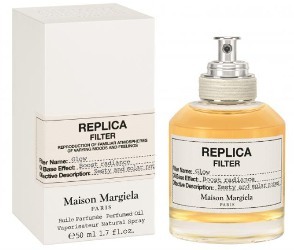 Maison Martin Margiela Replica Glow and Blur will be available in 50 ml Perfumed Oil. Blur sounds lovely to wear alone. Come to think of it, both of them do. Could be, although I imagine they’d be pretty basic? Thus confused the heck out of me at first because a filter removes things, and how can you remove something from an existing fragrance? Then I realized he meant a photographic filter (which technically still removes something, such as colour or sharpness, but at least makes sense as a metaphor). Yes — like photographic filters. Wouldn’t it be great if there were a perfume filter to remove that one annoying note making an otherwise perfect perfume unwearable?